Modern warfare in general and asymmetrical warfare specifically and in particular in the War on Terror have been especially characterized in recent years by the overarching reach and influence of technology, much of which has previously been classified due to its priority and the emphasis on national security. Even more specifically, technology in the form of unmanned aerial vehicles (UAV) and remotely piloted aircraft (RPA), also known as drones, has led to an explosion in their use militarily as well as publicly and commercially. The obvious advantage militarily is the absence of any real mortal danger to the human assets conducting missions in these aircraft. 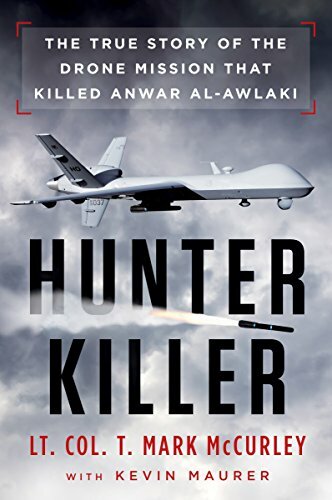 In spite of the lack of a minute-by-minute, blow-by-blow account of the circumstances behind getting the Al Quaeda terrorist, this is most definitely an interesting, informative and provocative read that details much of the development of the technology behind the drone program as well as that of the aircraft itself. Be aware, however, that one should be prepared to have plenty of the ubiquitous acronyms tossed around, in the dialogue and the text in general, for which the military is so famous. So it is necessarily to one’s advantage to have some familiarity with the military way of operating. For those unfamiliar, a glossary would have been helpful but is lacking. In any event, just as in any weapons program or system, drone development has evolved from smaller aircraft, used in surveillance and reconnaissance with limited ordnance capability, to larger platforms with greater offensive power and ability to spend more time on target. Considering the technology behind the program, training is at a premium as well in order to maximize its use and capabilities. Once these had been demonstrated in combat (ground support, eye in the sky, etc. ), enthusiasm for them and their remotely located operators increased exponentially among ground forces. With their cameras, lasers and ordnance, they are a stealthy asset, virtually immune to enemy countermeasures and rightly became known to the terrorist enemy in Iraq, Afghanistan and Yemen as “white devils” as there seemed to be no way to escape from them while being surveilled or “hunted” for anti-coalition activities or even in conventional firefights between ground forces. McCurley’s account of his own personal path to the drone program shows an Air Force Academy graduate and fighter pilot want-to-be who desires a career path to commanding his own squadron. In the end, he achieves his goal but only in terms of a RPA squadron which he finds satisfying as he has already demonstrated that he has made a personal contribution to the war effort and national defense, his ultimate goal. Inasmuch as this is a first-person account, there are no notes or bibliography and McCurley admits, in an author’s note, that the fog of war may have caused him to forget or misremember certain details. On the other hand, he has taken pains to not reveal certain aspects such as ongoing missions and used tactical call signs to protect the identities of those who may still be in harm’s way and/or perhaps subject to future retribution from terroristic elements. There is, however, and it is a highlight, a section of color photographs taken by the author and other airmen with whom he served which show many of the aircraft employed and the facilities where they served. Any figures in them are blacked out or have their backs to the camera for security purposes. The mission to get al-Awlaki was, of course, a success, dealing a considerable setback at the time to Al Quaeda recruiting and morale. Of perhaps more importance is the story revealed to the public here about the operations and missions to attain the successes realized so far through the RPA program. It goes a long way toward justifying our efforts and expenditures in the War on Terror in keeping our country safe and demonstrating the dedication and commitment of those who defend us, even if they are “remote” from the actual fighting.